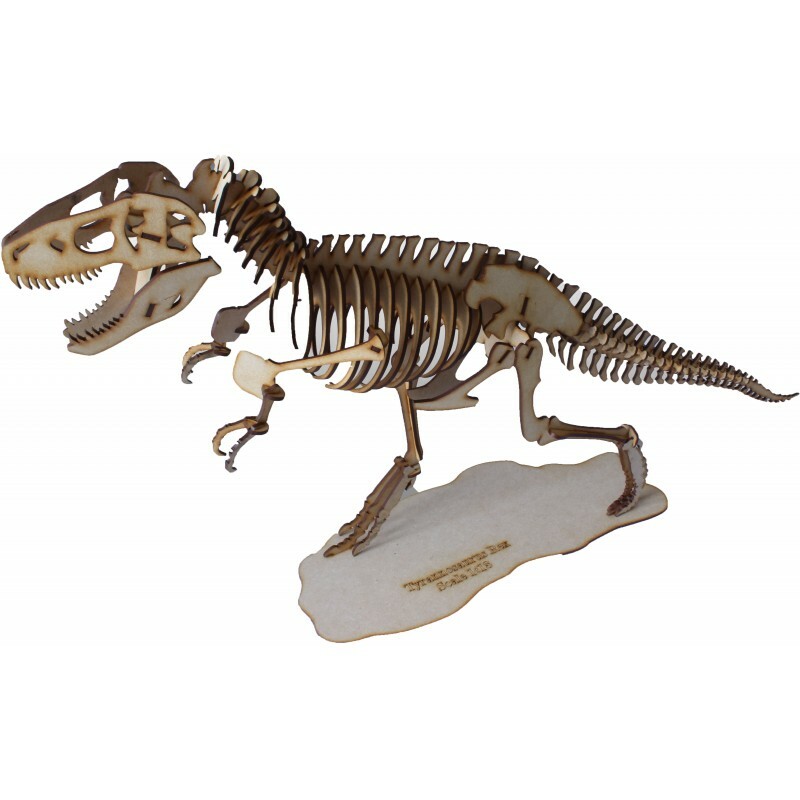 This Tyrannosaurus Rex (Anatomically Correct) ( T-Rex ) 3D Puzzle is recommended for children of 5 years and older. All the pieces of the puzzles slot into each other so the puzzle can be rebuilt as many times as you wish without glue. However, if you would like to display it on a shelf or in a cabinet we would recommend a bit of wood glue to keep it secure over a long period of time. The puzzles are made from wood so they can be painted with normal acrylic paint or spray paint. The puzzles do not come with instructions. The reason behind this is because it is a puzzle… and the fun part is trying to figure out how all the pieces fit together as you would with a normal picture puzzle; so hours of fun can be had with the entire family joining in. But please do not fear as help is only an email away. Contact Xplore Designs via an email and we will gladly send you instructions to help you and assist in any way we can. Tyrannosaurus; meaning "tyrant lizard", from Greek tyrannos meaning "tyrant," and sauros meaning "lizard") is a genus of coelurosaurian theropod dinosaur. 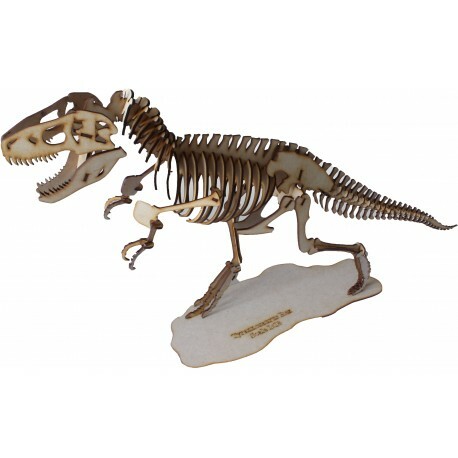 The species Tyrannosaurus rex (rex meaning "king" in Latin), commonly abbreviated to T. rex, is a fixture in popular culture. It lived throughout what is now western North America, at the time an island continent termed Laramidia, with a much wider range than other tyrannosaurids. Fossils are found in a variety of rock formations dating to the Maastrichtian age of the upper Cretaceous Period, 67 to 65.5 million years ago. It was among the last non-avian dinosaurs to exist before the Cretaceous–Paleogene extinction event. Like other tyrannosaurids, Tyrannosaurus was a bipedal carnivore with a massive skull balanced by a long, heavy tail. Relative to the large and powerful hindlimbs, Tyrannosaurus forelimbs were small, though unusually powerful for their size, and bore two clawed digits. Although other theropods rivaled or exceeded Tyrannosaurus rex in size, it was the largest known tyrannosaurid and one of the largest known land predators, the most complete specimen measuring up to 12.3 m (40 ft) in length, up to 4 metres (13 ft) tall at the hips, and up to 6.8 metric tons (7.5 short tons) in weight. By far the largest carnivore in its environment, Tyrannosaurus rex may have been an apex predator, preying upon hadrosaurs, ceratopsians, and possibly sauropods, although some experts have suggested it was primarily a scavenger. The debate over Tyrannosaurus as apex predator or scavenger is among the longest running in paleontology. However, it is commonly agreed amongst most scientists that Tyrannosaurus rex was an opportunistic carnivore, both predating and scavenging.